January 15, King of Prussia, Pa. – Results from a regional business trends survey show 66% of employers in the MidAtlantic region believe their organizations will see an increase in sales/revenue in 2013 as compared to 2012. 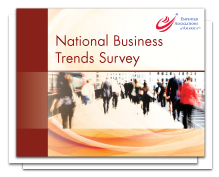 The 2013 Business Trends Survey, conducted by the Employer Associations of America, included regional results among members of the MidAtlantic Employers’ Association (MEA). This survey included responses from almost 1,600 mid-sized businesses (those with fewer than 1,000 employees), including 237 from the Northeast Region. “Overall, mid-sized companies in our region are cautiously optimistic about their growth and new hiring for 2013 with more than 87% planning to increase or maintain staffing levels,” according to Kevin Robins, CEO of MEA, a member-based association that supports the workforce related needs of mid-sized businesses in Pennsylvania, New Jersey and Delaware. Noted national and regional economist Joel Naroff, of Naroff Economic Advisors, joined MEA at an event announcing the results of the survey. Naroff commented that the U.S. economy showed some real momentum at the end of 2012 as consumer spending on just about everything including motor vehicles was solid. Moreover, the housing market is turning around and construction is picking up. Europe is starting to stabilize and Asia seems to have turned the corner. The only remaining uncertainty is the debate over the debt ceiling and spending cuts. Mid-sized companies in the MidAtlantic region identified the following as the most difficult positions to fill or retain: professional staff (39%), skilled production workers (30%), and high potential middle managers (29%). These regional trends correspond to the national trends. The survey also identified the following strategies to address these shortages: additional training and development for existing staff (49%), filling jobs with existing staff that lack necessary job skills but have potential (42%), and increased focus on retention where recruitment is difficult (35%). The Survey also identified that the most significant impediment to growth and hiring forecasts is economic uncertainty. 38% of the businesses in the region identified that as the greatest barrier to business growth which mirrors the national forecast. 14% reported a significant increase in sales/revenue in 2012 compared to 2011, while 44% reported a slight increase in revenue in 2012 over 2011. 66% believe their organization’s projected business outlook for 2013 compared to 2012 will see a slight or significant increase in sales/revenue (16% forecast a significant increase and 51% forecast a slight increase). 22% forecast a slight or significant decrease in sales/revenue. 34% of respondents believe the economy will be better in 2013 than 2012; 51% believe the economy will be about the same; and 16% believe the economy will be worse. 38% responded they plan to increase staff levels in 2013 while 49% believe they will maintain current levels. Only 6% believe they will be reducing staff levels in 2013. 66% of employers in the MidAtlantic region plan to hire in the 1st or 2nd quarters of 2013. In 2013, 49% of area employers are planning process improvement initiatives and 29% plan to shift a larger percentage of healthcare costs to employees. An impressive 87% of the executives surveyed report that 2012 was about the same or better when compared to 2011. In contrast, their optimism for 2013 seems to have tapered as 79% of the executives surveyed expect the outlook for the overall 2013 economy to be about the same or better compared to 2012 – down from 90% last year. This decreasing optimism likely reflects the turbulent economic and political environment of the fourth quarter of 2012. Employers struggled with business planning given a sea of unknowns ranging from the presidential and state elections, health care reform to the ominous Fiscal Cliff. Despite their more guarded response to the economic outlook, employers remain self-confident. “We see an interesting contradiction in the survey responses. While employers indicate a less jubilant perspective for the 2013 economy, their actions speak louder than words. While only 30% anticipate the overall 2013 economy will be better than 2012; 61% of business executives expect increases in their own sales/revenue,” says Jerry Bumgarner, a representative from the Employer Associations of America (EAA) survey research committee. This self-confidence is demonstrated in their optimistic business plans for 2013. Employer confidence has improved over one year ago with 72% of participating organizations actually giving a pay increase in 2012. This is up slightly from the 70% of participating organizations that planned an increase in 2012. 2013 compensation strategies demonstrate employer confidence as well. 66% of the respondents reported plans to award wage/salary increases in 2013, 35% are planning to award variable/bonus awards, and 9% will give lump sum awards during the year. A minority of the organizations surveyed (13%), plan to freeze or reduce pay – down from the actual 23% that froze or reduced pay as cost-cutting measures in 2012. Another mark of employer confidence is an increase in staff. 34% of the respondents plan to hire additional staff, with most of those expected during the first half of 2013. These results are similar to the past several years. An optimistic 36% of respondents have plans for significant new investments in people, facilities and/or equipment in home office locations to improve service capacity and/or revenue in 2013. Another 14% of respondents plan investments at other domestic locations and 5% at international locations. Executives are still concerned about the economy. When executives were asked what they believe is the greatest barrier to business growth in their industry, 38% said economic considerations. This is followed by 22% of the executives who indicated that the biggest barrier is consumer demand. Concern about the impact of future economic decline on job creation tapered slightly compared to one year ago. This year, 46% of executives deemed this the biggest barrier to job creation compared to 49% last year. The next two greatest response groups said the biggest barriers are limited consumer demand (19%) and government regulations (12%). The Employer Associations of America’s data reflects national conditions. EAA surveyed 1660 companies: 45 percent were from manufacturing, 7 percent were from Professional and Business Services, 6 percent were from Health Services or Financial, and 36 percent from other industries. The survey also represents all sizes of companies, from 1-99 employees (55 percent), 100-249 employees (25 percent), 250-499 employees (11 percent), 500-999 employees (4.4 percent), and over 1,000 employees (4.5 percent). The survey data was collected in October through November of 2012. The MidAtlantic Employers’ Association (MEA) is dedicated to helping private growing businesses in the region to leverage their internal resources so they can maximize the performance of their employees and organization without a significant investment.